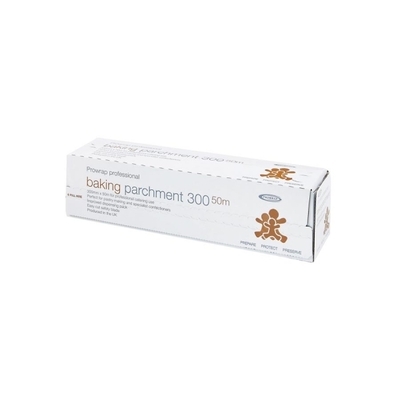 Our high-quality Baking Parchment has been developed for use in high-traffic catering environments or kitchens within nurseries, schools or care homes. Specifically formulated for professional use, this large roll offers exceptional grease free and non-stick function during baking. Suitable for use in both ovens and microwaves, the durable paper makes for a sensible alternative to regular baking paper and comes compactly rolled onto a cardboard tube for easy storage and distribution. The roll is supplied hygienic box and comes with a perforated edge to ensure a clean break on every use. Ideal for use when creating meringues, pavlovas, sponges. To ensure your next meal is as exceptional as you'd expect, we also stock a variety of Cling Films and Aluminium Foils in our Catering category. Our Baking Parchment is also available in the wider length of 45cm and is available here to browse.